Seward resident Kent Pribyl is full of smiles and thanks after a serious medical incident. Looking at Kent now, you could never tell illness fell on this happy-go-lucky outdoor enthusiast..
Kent agrees he may have ‘pushed his limits’ with his demanding chores. Judy thought to call their usual nurse at Seward Family Medical Clinic to see if Kent may need an appointment and was quick to describe Kent’s symptoms to Becky, Tyser, RN at SFMC. Becky knew just what was going on and urged Judy to get Kent to the ER right away. With no family history of heart attacks, Judy and Kent were unaware that the combination of Kent’s escalating symptoms could be a heart attack. Kent arrived at the emergency department of Memorial Hospital minutes after the phone call with Becky Tyser, RN. Becky had already alerted the emergency department and staff was ready for Kent’s arrival and to handle the heart attack that Becky recognized from the phone conversation. Upon arrival, Judy can only describe what occurred as a whirlwind of highly coordinated events executed by the skilled staff in the emergency department. Kent was quickly assessed. After the initial care was given to Kent, he felt much better and in true Kent fashion joked saying “maybe I’m not sick enough to be in the emergency room.” Although the care taken upon his arrival certainly helped Kent’s symptoms, the doctors and staff assured Kent that he was actively having a heart-attack and needed immediate attention. Time was truly of the essence and due to the severity of his symptoms, Kent was life-flighted to Bryan Heart. Kent’s initial admittance into Bryan Heart was to address his 100% blockage of his right coronary artery. Upon treating the 100% blockage, it was found that Kent had two other arteries with 70-80% blockages. Two weeks after his heart attack, Kent was scheduled back to Bryan Heart for a final heart catheterization of the 70-80% blockages. Kent was cleared and back at work nearly one month to the day from his heart attack. Cardiac Rehabilitation appointments were scheduled for Kent to continue his recovery that follows the American Heart Association guidelines. In MHCS’ cardiac rehabilitation program, the cardiac nursing team works with Kent to identify his individual cardiac risk factors that led to his event. Kent’s rehabilitation and education are tailored to his needs based on those risk factors to help prevent future cardiac events. Goals are set to keep Kent’s specific risk factors at bay. Both Kent and Judy are thankful for the seamless coordination of care between facilities, physicians and nurses. Judy relied on her faith and all the health care staff during this emergency. The coordination reduced their stress and allowed Kent and his family more time to focus on recovery. Looking back, Judy decided that 2016 was a pretty great year, indicating, “We could not have asked for a better outcome for Kent. We want to thank all the medical staff for their fast actions and excellent care of Kent.” For now, Kent will continue his cardiac rehab sessions at Memorial Health Care Systems and has incredible support from his wife, family and all the nurses and doctors assisting with the continuation of his care. November 14, 2016, will be forever ingrained in Kent and Judy’s memory for the fast action and skilled efforts of health care providers across multiple health care systems working to ensure Kent’s safety and return to health. Nicky Briggs, RN completes a pre-session assessment of Kent Pribyl. 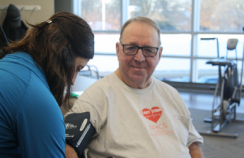 Kent, long time Seward Family Medical Center Patient and recent heart attack survivor, continues rehabilitation and heart health education with the MHCS' Cardiac Rehabilitation team.